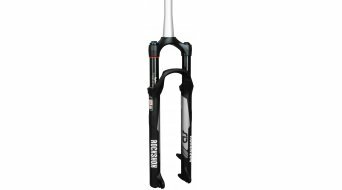 An ordinary MTB suspension fork consists of a head tube which has a press fit in the fork crown. The crown is again connected with the stanchions which slide into the lowers via slide bushings. If the fork is identified as tapered, its head tube has a conical shape. A modern suspension fork offers the finest adjustment possibilities so that it can be optimally fitted to the weight of the rider and to your intended purpose. If the settings are not fitted to yourself, it could not only spoil your fun in riding your bike but it could also become dangerous. A fork which is too soft can strike through if the impact is too big (this signifies the maxing out of the complete suspension travel), a fork which is too tight does not offer the desired performance. You can effortlessly adjust the settings of your suspension fork with just a little knowledge of bicycle tech. But whoever is having concerns or only very little experience in this regard, should have such matters performed by his trusted bike shop. The same also applies for the exchange and/or the installation of a fork. Whoever has experience with performing mechanic's jobs on the MTB, can pick up his tools and install a suspension fork and, if required, can also shorten its steerer tube. If that is not the case, we also recommend that you leave this work to a specialist workshop. The compression and rebound of a suspension fork controls the compression and rebound speed, it can work with an open or a closed system. An "open oil bath" is less susceptible for defects, but clearly requires more oil and is not as precise as a closed cartridge system. The open oil bath is only seldom used nowadays. Owing to adjustment buttons which can be operated from the outside at most forks, the settings can be adjusted without the use of tools in most of the cases. This hydraulic system is used to adjust the compression and rebound as well as to activate the lockout, if existing. Lockout describes the possibility to block the compression of the fork. Besides the lockout, forks alternatively also offer an additional adjustable platform, which does not block the fork completely but only in moderation thus reducing the suspension movement. The compression and rebound levels are adjusted by means of changing the cross sections of valves. The oil of the suspension fork is pressed through the valve and depending on the size of the opening, it can flow through faster or more slowly. Modern forks have multiple compression and rebound setup possibilities which work dependent on the compression speed or the compression depth. It is also good to know that various basic settings of your fork can be completely changed by means of different oil viscosities. Either a coil spring or an air spring will serve the fork as spring element. The air spring can consist of one or more air chambers. The air springs which mostly are more expensive, are lighter and can be adjusted to the weight of the rider much faster. An coil spring, on the other hand, is less prone to defects but also heavier. There are also forks which can be lowered, and they also mostly use air springs. The lowering of normally 20-50 mm causes a change in the geometry of your entire mountain bike and thus results in changed climbing and/or downhill characteristics. This function is significantly contributing to the broad range of applications for which you can use your bike. In terms of seals, a low friction is important in order not to negatively influence the response behaviour. Tight seals do not only increase the break loose torque and thus increase the direct transmission of vibrations, but they also are less long-lasting. One also differentiates between oil and dust seals. The dust seal sits at the upper edge of the lowers and protects mainly from incoming dust, mud or water. Oil seals sit a little lower in the lowers and prevent the leakage of oil from the fork. There are also seals which combine both functions in one seal. Now, you should have picked up some basic knowledge of the function of the suspended fork. It's time to discover the large selection here in the shop. We have divided the MTB suspended forks into the respective inch categories, 26 inch forks, 27,5 or 29er forks, so that you can choose by size. You will also find spare parts for the suspension fork as well as coil springs at favourable prices right here in the shop.